We've out grown our blog....check out our new one here!!!!! When he got home he was thrilled to show me that he had made me a recipe holder and to explain that he had made it with three different types of saws. I LOVE Andrew's enthusiasm in everything he does!! ALL of our kids LOVE to go sledding.....everyone except Benjamin. Every time we go sledding, we ask Benj if he wants to go and he always says, "No Way! ", and so mom gets to stays home with him. Well, we all wanted to go on Andrew's birthday so Nathan told him that he could wear ski goggles (he loves goggles...so much that he wore his swimming goggles to go Christmas caroling last week) when we go sledding and he finally agreed to go. I love that we were actually able to capture on video him having SO much fun and then when asked if he wants to do it again, he says, "No Way!" So much personality!!! It doesn't look like Spencer is having fun, but he really LOVES sledding so much that he doesn't even need a sled...he'll just go on his bum. Andrew says, "It's Great to be Eight!!" Andrew had a GREAT birthday! He got to open presents as soon as everyone was awake. (Nathan found Andrew sitting on the stairs at 6am and made him go back to sleep on the couch until everyone else woke up.) He got a BSU football from Benjamin, a Rubix Cube from Spencer, a book from Sarah, a BSU sweatshirt from Nonnie & Grandpa, money and cards from Grandma & Grandpa, Mom & Dad and cousins that he put towards a NEW MOUNTAIN BIKE. Here is Andrew "trying out" his new bike. 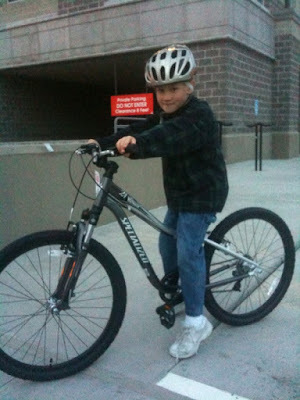 He and dad shopped for the perfect bike a few days before his birthday but he didn't get it until his actual birthday. We went sledding. Andrew is getting pretty good at snowboarding. To finish out an awesome day, we ate pizza, had Oreo birthday cake and then watched G-Force. Happy Birthday Andrew!!! At our Book of Mormon party we told the waiter that it was Andrew's birthday (close enough, right?!) so they sang to him and brought him a yummy dessert. He LOVED it!!! Our neighbors, Josh and Melissa came over this morning and asked if our kids wanted to help them make an igloo. Everyone helped, but Sarah definitely stuck with the task the longest. They were all thrilled with the final product. It's SO big, that all the neighborhood kids who helped can fit in it. Thanks Josh and Melissa for a lot of fun and great memories. ...a picture of the final product. Sarah wants to sleep in it tonight. Anyone up for a 9 degree sleepover????? Sunday night we completed reading the Book of Mormon. So, to celebrate this amazing goal that we accomplished we went to Cafe Ole (kids eat free on Monday nights :) for dinner and to Powell's Sweet Shop afterwards. We always have Book of Mormon parties (usually during FHE) when we finish reading it, but this time it was EXTRA special because we read the WHOLE thing...not just the illustrated Book of Mormon stories....but the REAL thing!!! It's taken us almost 2 years and we have been reading a lot each day for the past two months so that could finish before the end of the year. Yep, we were pretty proud of ourselves and thought we all deserved to celebrate!! On Christmas Eve we acted out the story of baby Jesus. Everyone had very important parts to play. They all got to open one gift....they got sleeping bags from Nonnie and Grandpa...THANK YOU SO MUCH!!!!! They got the cookies and milk ready for Santa and put reindeer food outside for the reindeer. Then, they all promptly went to bed...not sleep, just their bed. Sleep didn't come for awhile!!!!! Early Christmas morning, four cute kids are ready to come downstairs to see if they have been good enough for Santa to have stopped at their house in the night. Our dad took this picture before everyone came downstairs. He kept on saying that there was something he had no idea what it was. Santa had left four Zhu Zhu pets and a playground and no one at our house knew what they were until we started playing with them and looked them up online. This is how our cute kids spent a lot of their Christmas day...just relaxing and enjoying all their "loot"!! Santa completely spoiled them again this year. They must really be on the "NICE list"!! !